Eyelid cosmetic surgery, or blepharoplasty, is an operation which corrects drooping eyelids as well as puffy bags and bulges about the eyes. These conditions develop as a result of laxity of the eyelid skin and protrusion of fat around the eyes. It is not limited to older patients, as many individuals inherit a predisposition toward development of fat pouches at an early age. Eyelid surgery can correct drooping upper lids and puffy bags below your eyes – features that make you look older and more tired than you feel, and may even interfere with your vision, a visual field impairment. In some cases a browlift or foreheadlift is also required to fully correct the problem. In the caucasian upper eyelid the deeper layers of the eyelid converge 6 to 8mm above the eyelid margin/eyelashes and 3 to 5mm above the upper edge of the eyelid cartilage to create a fold. In the Asian or Oriental upper eyelid these layers do not converge so there is no fold. Additionally the fat descends into the eyelid giving the puffy look that is commonly seen in asian upper eyelids. The surgical procedure to correct this involves removing some of this fat and suturing these layers as well as the skin of the eyelid to the upper edge of the eyelid cartilage in order to create a fold. The puffy look is thereby also diminished. The suture used is absorbed by the body but the healing process keeps the new point of convergence intact. The result is creation of a double lid. The inner corners of the eye remain unchanged so that an Asian look still exists. To treat the fold at the inner corner of the eyes if it is present and if the patient wishes it addressed it is best to augment the nasal bridge. This takes up the excess skin and gets rid of the inner corner skin fold without leaving any visible scar. Some minor surgical procedures have been devised to treat the inner corner fold but these leave scars in the area and do not address the cause of the problem which is insufficient nasal bridge in the Asian nose. Filipino woman who under went upper eyelid blepharoplasty for impaired vision, covered by health insurance. 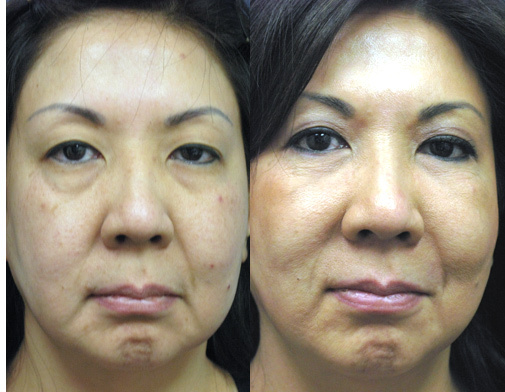 Chinese patient before and after upper and lower blepharoplasties of all 4 eyelids. Japanese patient before and after upper and lower blepharoplasties of all 4 eyelids to remove excess skin and lower eyelid bags. Blepharoplasty – eyelid surgery can enhance your appearance and your self confidence. Realistic expectations are important to be happy with any surgery. As each patient is an individual, different results can be expected in each patient.